By the end of 1955, the comics industry as a whole was in a downward spiral that seemed as if it had just about finished the comics for good. The Comics Code Authority and it's rules and regulations forbade many things. Only a few publishers would not be affected by the changes. The two piece bathing suit would not be seen in comics for more than ten years. Criminals must pay for their crimes, no blood, no gore, words like weird, horror and terror could not be published on the covers (not just in the titles) and on and on. Dozens of smaller publishers went out of business, unable to overcome the difficulties caused by the regulations, or just their own inventiveness. EC discovered that by publishing Mad magazine they could make more money than they ever had publishing comic books and closed down with the exception of Mad, which went on to become one of the most influential and popular humor magazines in the decades since. Atlas (aka Marvel) would almost go out of business. DC would only be affected by the lower circulations of titles during this time. Their homogenized approach to comics helped them to avoid the disasters heaped on publishers like EC. Not a DC title needed to be changed because of code regulations, they were in good shape. Dell also did not need to make any changes as they most certainly always published "family oriented" products. Dell did not even need to ascribe to the Comics Code as they always enforced their own code so to speak. For years Dell would be the only company to not carry the code seal on the covers of their comics. Comics almost were dead, and they needed a boost. American culture has always followed a course or "fad" for short periods to keep up with the tastes of hundreds of millions of people. When the comic strip was first published, they were all universally humorous in content. There were many reasons for this, the main reason no doubt being the rather experimental nature of the medium and another that it takes awhile for adventurous individuals to make small changes that allow other individuals to make more changes. Swinnerton, Dirks and Outcault may have birthed the American comic strip but Winsor McCay injected sci-fi fantasy into it as well as a week to week continuity. Harold Gray, Roy Crane and Sidney Smith gave it adventure, and then Edgar Rice Burroughs and Phillip Nowlan contributed the first true adventure characters to the comic strip, and on the same historic day as both Tarzan's first daily strip and Buck Roger's appeared on January 7, 1929. Of course Alex Raymond, Milton Caniff, Chester Gould and Hal Foster would make some of the largest contributions to the comics before a new creation was introduced to comics by two teenagers. Siegel and Shuster revolutionized the industry and created the "super" hero, "Superman" who influenced the entire industry. These heroes reigned supreme over the industry for ten years before the end of the second world war reduced the number of villains left for them to fight and crime comics then became very popular, followed by injections of teenage humor, jungle themes, mystery, science fiction and horror. Super heroes had taken a back seat. As a matter of fact, with the exception of DC, no company had published a super hero comic book continually throughout this period. Most super hero comics published by other companies lasted a few short issues. 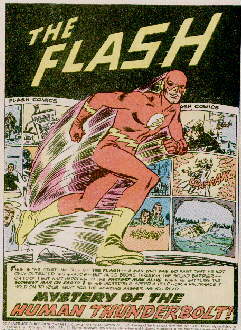 Timely published very few superhero titles from 1949 until Fantastic Four #1 in 1961. But with the reduction of themes now available to publishers because of the with hunt shake-out, companies still in business had to find some new ideas. Sometimes, new ideas are really just old ideas, and making new ideas out of them are as easy as pie. So it was when DC editor Julius Schwartz decided the new comic title he was editing needed something.